I went by myself to see Willow today... everyone was still at church, so no one was at the farm. It was so quiet there, rainy and peaceful. 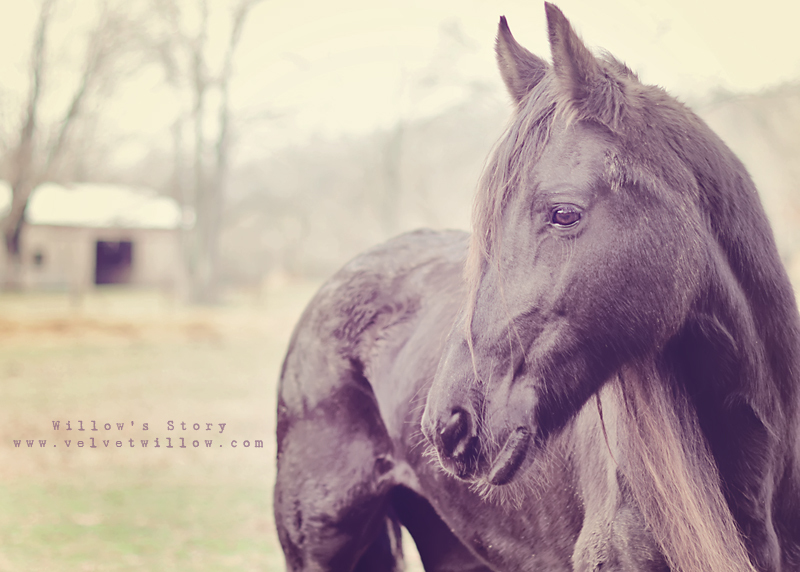 Willow was in her pasture with her new mates, a pair of very old Percheron mares named Alice an Aida. I remember reading an article about how Martha had helped rescue them years ago. They didn't look up as I opened the noisy gate, but Willow looked up and before I could finish calling, "Willow", she picked up her head and started strolling toward me. So far, one of my favorite things about having a horse is the make that long, slow, but happy walk across the pasture to see you. I just love that. The only fun part about having a horse that needs to put on weight is that I get to give her LOTS of treats. I try not to hand feed her *too* much (although I love to), so she won't ever get nippy, but I brought her cut up apples and carrots and she loved them. Always worrying that she won't be able to swallow or that she will begin to choke, I am very careful and apprehensive. But Willow did great! I spent a long while with her in the pasture... just hanging out with her. Braiding her hair, scratching her neck, and looking in her eyes. She gets eye level with me, and she just looks at me- and I see myself in those dark, soulful eyes of hers. She is so deep- even Martha thinks she is. And she is very wise. After a while, I walked over to meet Aida and Alice. Gosh they are HUGE! Big, beefcake mares... almost like cows - so stalky and very sweet. As I scratched their thick necks, I couldn't help but compare them too Willow and her tiny frame. I wondered how long it will take until she is of normal horse weight. I looked over at Willow who was happily grazing and enjoying the wet grass... I smiled and tried so hard to stop myself from thinking too logically. I mean, most horses eat 20 something hours a day just to maintain their weight. Willow can't eat that many hours... she has swallowing issues, she struggles and sometimes chokes. She probably eats slower than most because of her fear of choking. How will she gain weight... how will she even maintain it? I really need to find a way not to let this kind of worry and fret enter my mind. Today was such a good day. We used to add "crimped corn" to our horsed feed in the winter to help them keep the heat in and the fat on. It has no nutritional value but it can add weight. That and maybe put extra molasses in her feed if you give her sweet feed. The grass pellets are a great idea too. I'm sure the professionals that are helping you will give you good advise about it. I've been following your blogs for years, ever since I was embarking on our first adoption trip to China. I just wanted to say how much Willow's story has touched me, and let you know I'm praying for her recovery! She is such a beautiful, sweet girl, and I'm so glad you've come into each other's lives! Shana, so much love in your words and actions, I am sure Willow will recover by summer. On the other hand, I cant stop thinking to who you called a "businessman". The one good thing about animals is they don't live in fear like we do. I've briefly followed her story on Facebook and enjoy seeing updates from Rood & Riddle, but just sat down to read the full length story. ;-) I just keep crying. I got "into" horses after I graduated high school. The bond formed between a human and a horse is unlike any other. And I realize why they're the only animals mentioned of being in Heaven in the Bible, they are a perfect creation. The ignorance, selfishness, and downright cruelty shown by some people towards animals will forever disgust me. I'm a bleeding heart and I really hope to see the day when animal abuse and neglect is more than a couple hundred dollar penalty (IF they are punished at all). So happy that Willow has found her Heaven. No doubt you are as much her angel as she is yours.